While it is important to use sunscreen regularly during outdoor activities this summer and throughout the year where skin is exposed to the environment (see previous recommendations on sunscreen use) there are some newly recognized hazards that should get our attention. Some sunscreen gel and solution formulations contain alcohol which can ignite when exposed to flames such as can occur when close to barbeque grills, stoves, and open flame fire pits. Serious burns can occur as a result of being too close to these potential ignition sources. Either avoid using the sprays, solutions and gels and substitute non-alcohol-containing sunscreen lotions and creams or keep away from sources of open flame. With the warming up of the regional Lakes, more people will be visiting the water and swimming and enjoying the refreshing dips. Unfortunately in our lakes a hidden biological hazard exists in the form of parasitic organisms present in the droppings of geese and ducks. The parasitic organisms called “trematodes” or “cercariae” can invade the human skin and cause itching and a subsequent rash within minutes to hours of the exposure. This “Swimmers Itch” is not serious and will spontaneously heal in several days without treatment. The rash and itching can be avoided by taking a shower right after the Lake water exposure and vigorously rubbing the exposed areas with a towel. Frequently, just drying and rubbing the skin with a towel may prevent the infestation. Have a Sun Safe and Water Safe Summer! Ever wonder what causes those dark circles on the lower eyelids of some people? Lower eyelid “dark circles”, medically known as multifactorial blepharal hyperpigmenation, are caused by a combination of factors in most people including thinness of the lower eyelid skin, repetitive rubbing or inflammation of the eyelid skin as with allergies, increased prominence of small blood vessels in the tissue layer below the skin and genetic factors. Other than using makeup or concealer there are no practical self-treatment options for this condition. However for those individuals seeking improvement or elimination of the dark circles, Dermatologic treatment with specific lasers and medical filler materials can offer a solution for most patients. Please see our section on Laser Treatments for additional information or call us at (425) 391-2500 for an appointment to discuss your treatment options. If you have ever wondered why you or others you have observed have a red-colored complexion or flush easily, there are several causes for this skin quality and treatment is available. While everyone’s skin will become pink or red with exposure to cold temperatures, wind and sun there are individuals whose skin has this quality constantly and which may occasionally suddenly increase in intensity. Rosacea, a condition of the skin, is the most common cause for red faces and may be a hereditary or acquired quality. Rosacea is caused by an increased concentration of tiny blood vessels, capillaries, in the skin and with a tendency for these tiny blood vessels to dilate or enlarge and fill with more blood during periods of emotional expression or as stimulated by certain foods and beverages such as spicy foods and alcohol and hot liquids. Exposure to extremes of the environment including hot or cool temperatures, wind and sun will also increase the intensity of the redness. This condition can be accompanied by visible blood vessels such as telangiectasias or so-called “broken capillaries” and inflammation of the skin with acne-like qualities. Exposure to significant amounts of ultraviolet light and sun over years can also cause skin to have a constant red color apart from Rosacea. Treatment is available and very successful with specific lasers such as the V-Beam laser having the ability to permanently reduce the amount of redness and visible blood vessels in the skin. Occasionally medication, topical or oral is required to reduce the inflammation present in certain cases of rosacea. If you have a red face and would like to reduce the amount of redness in your skin please contact us for a consultation to evaluate your treatment options. During the cooler months of the year exposure to lower outdoor temperatures and wind as well as dry air form inside of buildings and home from furnace heat will cause the skin to become drier. Without taking measures to counteract these drying influences the skin will tend to become flaky and itchy and more prone to irritation from bathing and cosmetic products. Dry skin is also more susceptible to infections and allergic reactions as well looking more weathered. Applying protective moisturizing creams before heading outdoors and following bathing while the skin is still moist will help reduce the drying influences. Making sure that the home has a humidifier or at least a portable humidifier in the bedroom will also reduce the effects of furnace heat on the skin. Also remember to reduce the time in the shower and avoid excessively warm showers or bath temperatures.If the skin begins to show signs of inflammation and eczema the temporary use of an over-the-counter 1% hydrocortisone cream for a few days in conjunction with improved moisturizing may resolve the condition. If it doesn’t and the other measures have been taken it’s time to see the Dermatologist for an evaluation of the skin and some additional help. Our Medi-facials have a wonderful hydrating effect on the skin and can keep the skin looking more healthy and youthful throughout the seasons. Please ask us about our Fall Specials. Every reasonable effort should be taken to avoid getting a sunburn whether from natural outdoor light or from indoor tanning beds (strongly discouraged!) due to the obvious short-term discomfort and not so obvious long-term DNA damage that the sunburn causes. A sunburn is evidence of the reaction of the skin to a significant and occasionally serious ultraviolet radiation injury to the top layers of the skin. In addition to the redness and sensitivity of the skin following a sunburn, a change in the DNA structure of the skin cells can occur which in some cases will lead to the future development of skin cancer, especially if the sunburn injury is severe or repetitive. Mild sunburns should be treated with avoidance of additional ultraviolet radiation or outdoor light exposure and soothing dressings with cool water and cotton towels followed by the application of a bland moisturizing cream such as Vanicream or Moisturel cream as examples. Topical calamine lotion or bland Aloe vera preparations can also be soothing to the skin but Aloe vera products vary widely and some products can be irritating to the skin. For more significant discomfort the application of an over-the-counter hydrocortisone cream may offer additional comfort. Anti-inflammatory medications such as ibuprofen may provide additional relief and itching can be relieved by oral Benadryl. Topical Benadryl is not recommended. For more severe sunburns which may involve blistering and greater discomfort a visit to a physician is recommended because of the risk of dehydration and heatstroke and the possible need for prescription pain medications and prescription anti-inflammatory drugs as well as more elaborate skin protective ointments and dressings. Remembering to apply an effective broad-spectrum sunscreen product with a SPF 30 or higher (see skin heathcare tip from May) early and thoroughly to the skin before outdoor sun exposure and reapplied regularly especially following any water immersion or sweating and the use of shade whenever possible will help reduce the risk of getting sunburned. Sun protective clothing and trying to avoid exposure during the peak hours of ultraviolet light intensity (cloudy or sunny days) between 10-3 will also be helpful. Enjoy a healthy and sun safe summer. The current rating system for sunscreens primarily provides information on the shortwave ultraviolet light, UVB in the form of the SPF number. An SPF number of 30 or higher provides the best protection. A protection factor rating system for the long wave ultraviolet light, UVA is currently being developed and will soon appear on the packaging of sunscreens. Until then choosing sunscreens which contain zinc oxide,avobenzone or Helioplex or ecamsule will provide good protection against UVA. Sunscreens should be applied 30-60 minutes before outdoor exposure in two layers, the first rubbed in well and a second coated on lightly to provide the best effectiveness. Reapplication depending on activity and water exposure or sweating should be done every 1-4 hours. Many of the chemical ingredients in sunscreens have a short effective shelf life and should be replaced after the expiration date to provide the rated protection. Sun damaged skin can appear as red or with many so-called broken blood vessels (telangiectasias), containing rough scaly areas (actinic keratoses), blotchy with excess pigment (dyschromia) or thin with wrinkles and easy bruising (atrophic). The more severely damaged the skin is, of the more of these qualities will eventually appear. Dr. Michalak uses many treatment options for the repair and rejuvenation of sun damaged skin. These include topical medications, short downtime and quick recovery procedures. 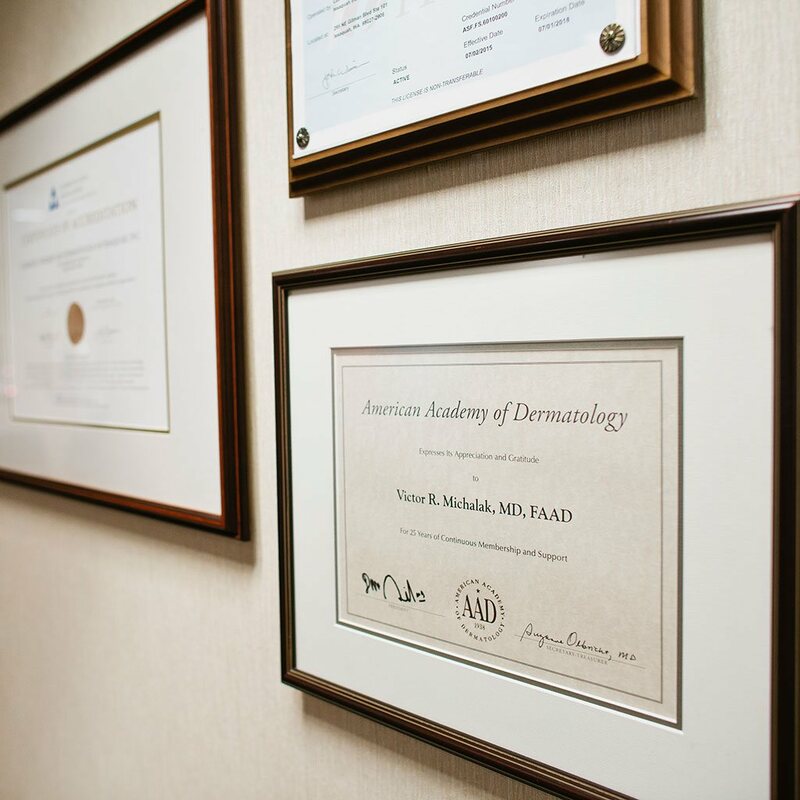 A dermatologist directed treatment program can restore the skin to a healthier state and improve its appearance removing many of the signs of aging. UV Radiation from the sun and tanning beds causes many changes to the skin including the break down and thinning out of the collagen fibers in the skin. This reduction in healthy collagen causes many of the wrinkles and features of aging that are unwanted. The quality of the skin of the hands and the appearance of the skin around the eyes tends to be associated with aging, and we often omit applying sunscreen to these areas. Remember to apply sunscreen to the back of the hands and the skin below the eyebrows and around the eyes, to help protect these areas from early wrinkling. What treatment(s) do we recommend to restore aging, sun-damaged hands? Treatment of the skin of the hands and eyelids with one of our state-of-the-art fractional lasers can greatly improve the appearance of the skin in these areas and reduce those signs of photo-aging including tightening the skin, smoothing wrinkles and eliminating those dark spots. Call or email us for additional information.